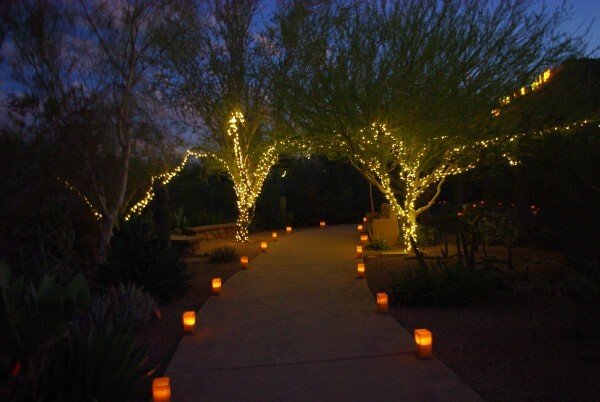 Every year the Desert Botanical Garden creates magic in the garden with Las Noches de las Luminarias. This year the spectacular event not only included glowing luminarias and excellent entertainment but also the beauty of Chihuly in the Garden sculptures along the garden trails. 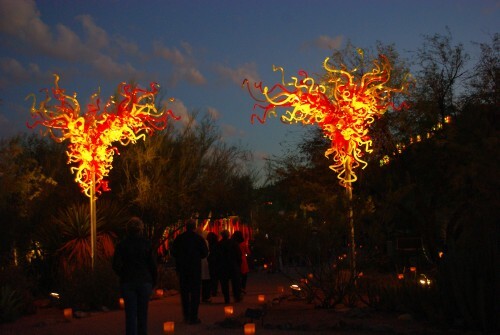 Chihuly’s “Desert Towers” glow as visitors enter the Desert Botanical Garden for Las Noches de las Luminarias. 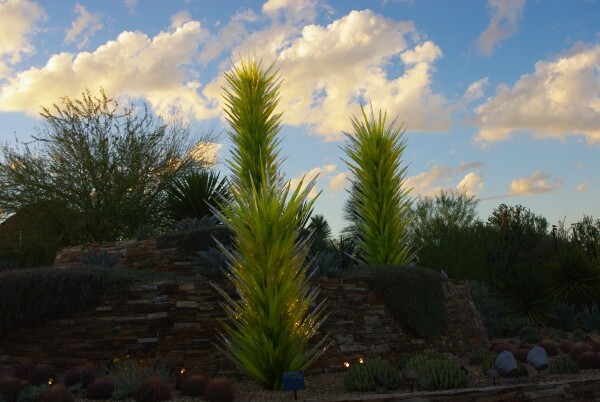 As visitors crossed the metal bridge leading into the garden, the Chihuly “Desert Towers” glimmered in the waning light. Beyond the sculpture the members of Mariachi Pasion played lively Christmas music. 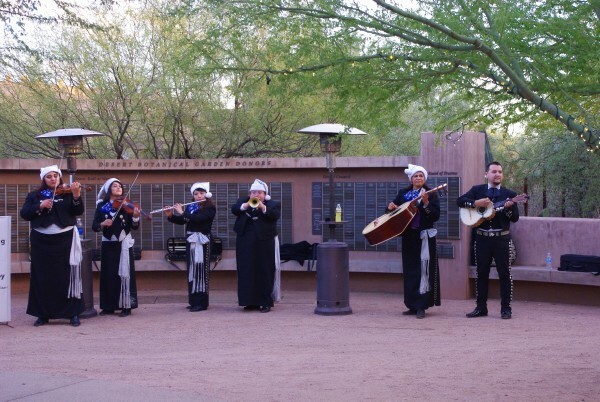 Mariachi Pasion entertains visitors at Las Noches de las Luminarias. Visitors patiently waited in lines for the gates to open on their night of magic in the garden. The sun sent out its last rays as it set behind Barnes Butte in the distance. 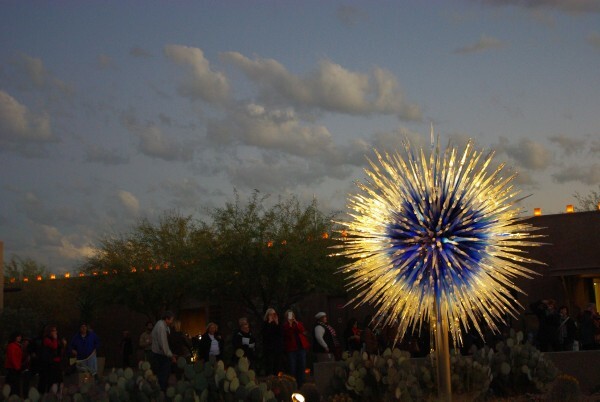 Chihuly’s “Sapphire Star” glows in the evening light as visitors stream into the Desert Botanical Garden. 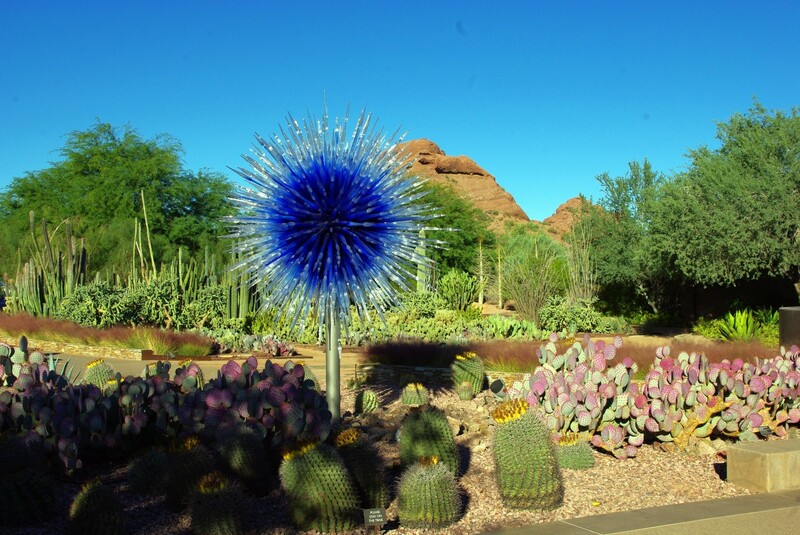 As they entered the garden, visitors crowed around the Chihuly “Sapphire Star” to get some great photo opportunities. 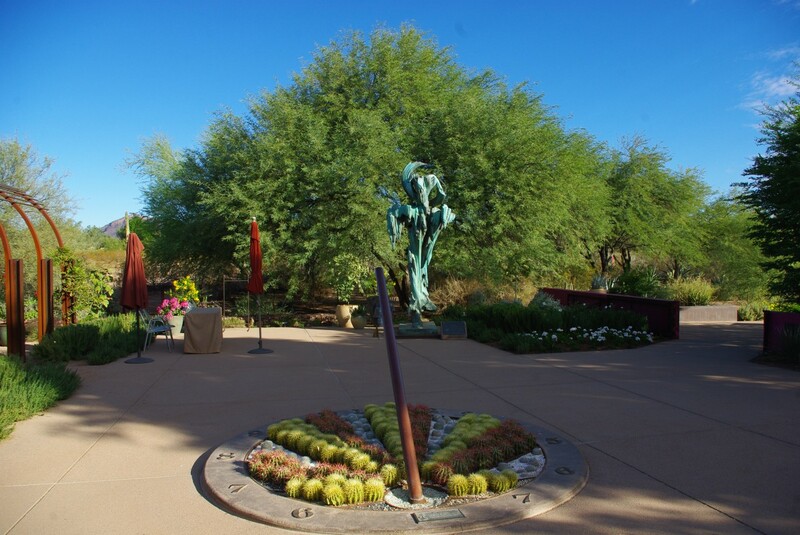 Others walked through the Ottosen Entry Garden to look at the “Blue Fiori Sun” and the “Citron and Yellow Fiori” or wandered to the Desert Wildflower Loop Trail. The “Scarlet Asymmetrical Tower” and the “Yellow Asymmetrical Tower” act as bookends for visitors to enter the Desert Discovery Loop Trail. The “Scarlet Asymmetrical Tower” and the “Yellow Asymmetrical Tower” act as bookends to the entrance to the Desert Discovery Loop Trail. People stream between them on their way to see more of the Chihuly sculptures and to hear the various musical entertainment positioned along the garden trails. 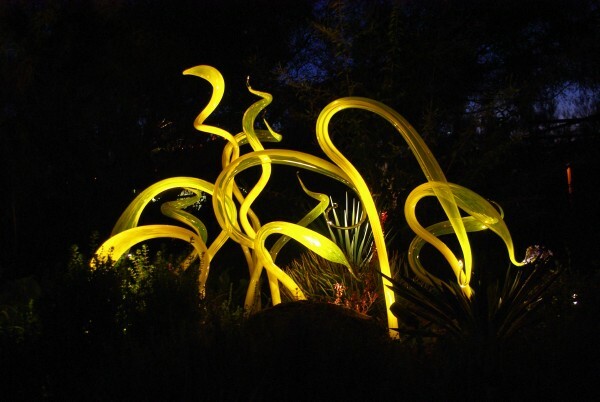 Chihuly’s “Yellow Herons” nestle among the plants in the Steele Herb Garden. In the Steele Herb Garden, Flamenco guitarist Chris Burton Jacome serenaded visitors. The huge statue “St. Earth Walking” loomed next to his group and the “Yellow Herons” sparkled in the plants behind the audience. Luminarias illuminate the trails throughout the Desert Botanical Garden. The hike up the Sonoran Desert Trail brought views of the lights in the Valley, and additional Chihuly creations among the desert plants. At the very top of the trail, the stories and music of Estun-bah an Apache word translated to “For the Woman” drifted up from the Plants & People of the Sonoran Desert Loop Trail. Tony Duncan, who played the Apache cane flute, shared his story of planning to teach his two-year-old son to play the flute. He said he wanted to name his son Tony, Jr., but his father got the honor of picking the name, so his son is named Naiche after chief Naiche, the son of Cochise and who also rode with Geronimo. “White Belugas” nestle in the arms of a saguaro skeleton. Walking along the People & Plants of the Sonoran Desert Trail, “White Belugas” sculptures nestle among the arms of a fallen saguaro skeleton. Visitors also see the “Sonoran Boat” as its beautiful colors reflect on the pond’s surface, and a number of “Blue Crystals” float in the water across from the boat. The “Sonoran Boat” and the “Blue Crystals” float on the pond. Further along the trail, at one of the Native American shelters, Porangui mesmerized his audience with the enchanting sounds of his didgeridoo. He explained the instrument was made from the stem of the flower that grows from the agave. On the other side of the trail, visitors again hear the Apache stories and music of Estun-bah. And as they wind down to the end of the trail, the magnificent “Scarlet and Yellow Icicle Tower” rises from the desert floor along the trail. Visitors stop to snap a photo of the exquisite sculpture before they exit the trail and head back onto the Desert Discovery Loop Trail. Chilhuly’s “Scarlet and Yellow Icicle Tower” rises near the exit to the Plants & People of the Sonoran Desert Loop Trail. 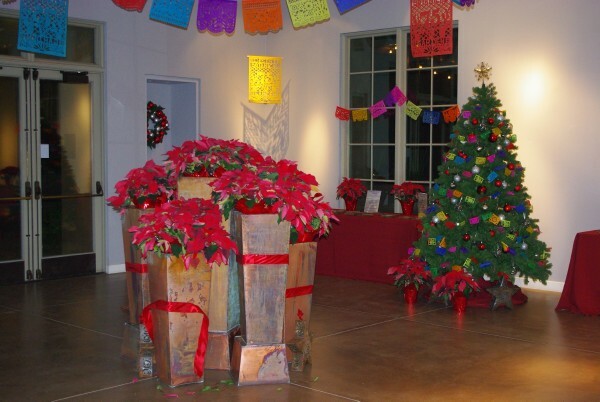 A Christmas tree and poinsettia center piece decorate a room in Dorrance Hall. 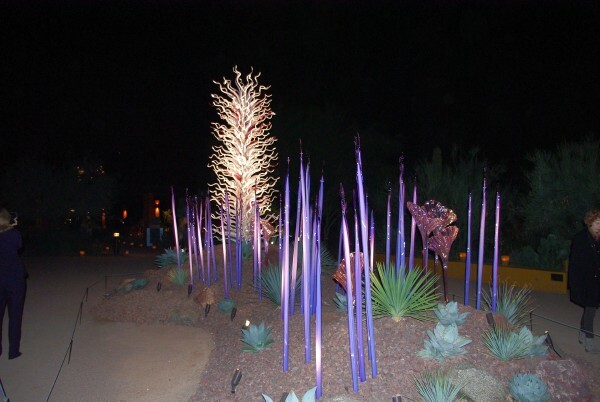 Back on the Desert Discovery Loop Trail, more of Chihuly’s sculptures gleam in the luminarias glow. 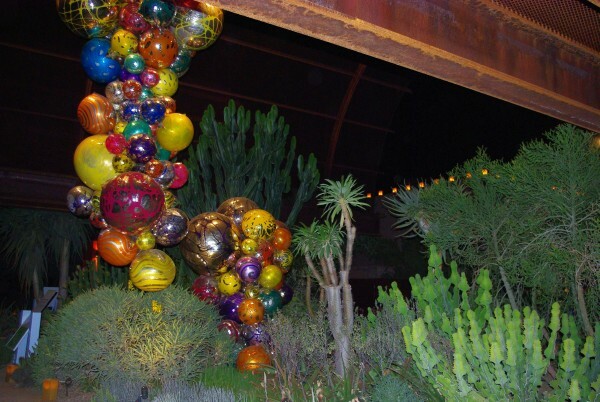 Inside the Sybil H. Harrington Succulent Gallery, a huge, colorful chandelier, the “Polyvitro Chandelier and Tower,” hangs from the metal beams of the structure and nestles among the plants and succulents. The “Polyvitro Chandelier and Tower’ hangs from the metal beams of the Succulent Gallery. In the center of the Stardust Foundation Plaza, the “White Tower and Erbium Fiori” glint and sparkle from the lights trained on the sculptures. Visitors stop and examine the sculptures as they make their way from one gallery to the other. The “White Tower and Erbium Fiori” glows in the center of the Stardust Foundation Plaza. 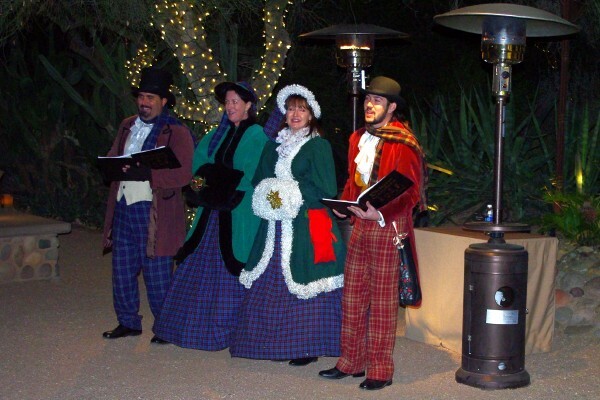 At the Amphitheater, the Dickens Carolers sing traditional Christmas carols. They sport vintage costumes and take requests from their audience. The Dickens Carolers sing traditional Christmas carols for their audience. The magic of the night ended at 9:30 p.m. when the luminarias got snuffed out, the lights got turned off and the garden reverted to its sleepy, desert appearance. It was almost like a fairy tale! 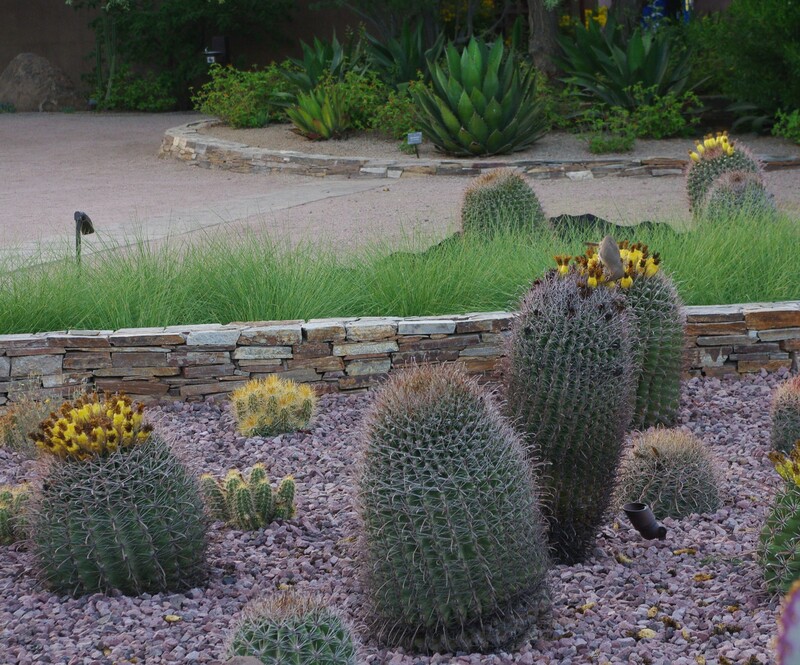 The diversity of the Desert Botanical Garden always amazes me. When I arrived at 8:30 a.m. on Sunday, Nov. 3, the sights of the garden immediately transported me into a magical world. As I crossed the metal bridge leading up the path to the entrance, the old, familiar Chihuly “Desert Towers” sparkled in the brilliant morning sunshine. The Chihuly “Desert Towers” sparkle in the morning sunshine. After I walked through the entrance, one of the many new Chihuly sculptures erected at the garden greeted me. This sculpture was part of the new exhibit, and ambitious people still erected additional sculptures on closed paths in the garden for the opening of Chihuly in the Garden slated for Nov. 10. After snapping photos of the sculpture, I headed for the Desert Wildflower Loop Trail. At that time of the morning, it’s quiet and so Gambel’s quail scurry across the trail, hummingbirds sip nectar from flowers and butterflies float among the plants and cacti. A Gambel’s quail scurries across the Desert Wildflower Loop Trail. Next I stopped at the Herb Garden to walk the Center for Desert Living Trail. 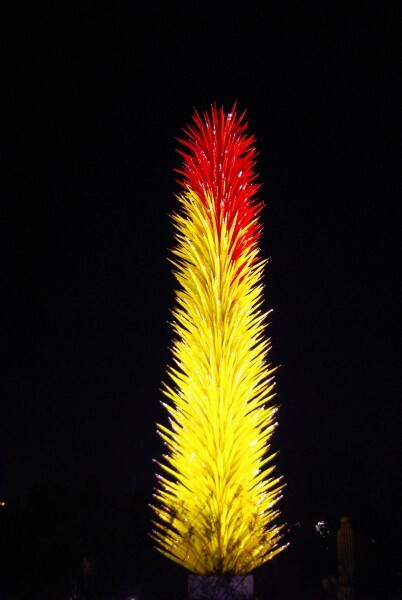 Another Chihuly sculpture sprung up in the Herb Garden, but my most favorite site contained the huge statue “St. Earth Walking” and the sundial. I never pay attention to the time when I’m in the garden, but the sundial with its neat rows of cacti and the huge statue add a unique twist to the garden. Meandering along the main Desert Discovery Loop Trail took me between the some of the largest cacti in the garden as I walked by the Webster Center and headed for Ullman Terrace. 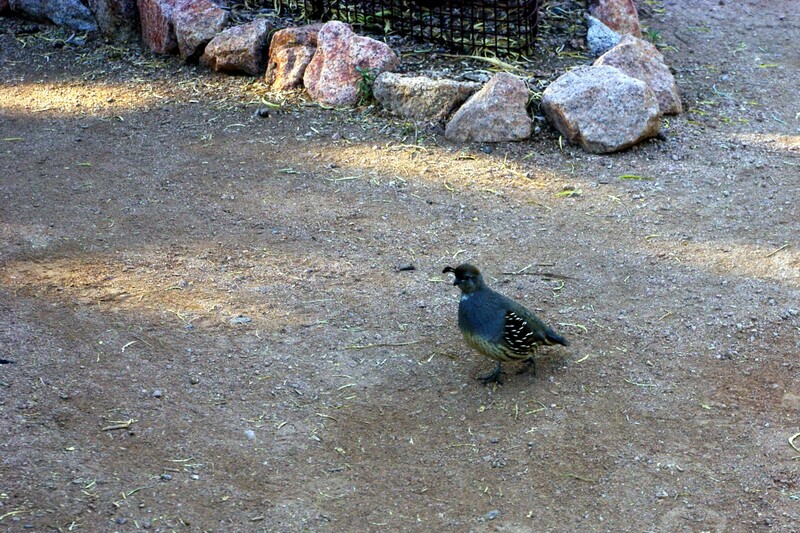 Fat Gambel’s quails and other small desert creatures inhabited the almost deserted patio area. Huge Cacti spring up along the Desert Discovery Loop Trail. From there I climbed the Sonoran Desert Nature Loop Trail, which contained many Chihuly creations. When I reached the top of the trail, I admired the views of Camelback Mountain and the surrounding areas. Only Gambel’s quail and other desert creatures occupied the deserted Ullman Terrace. 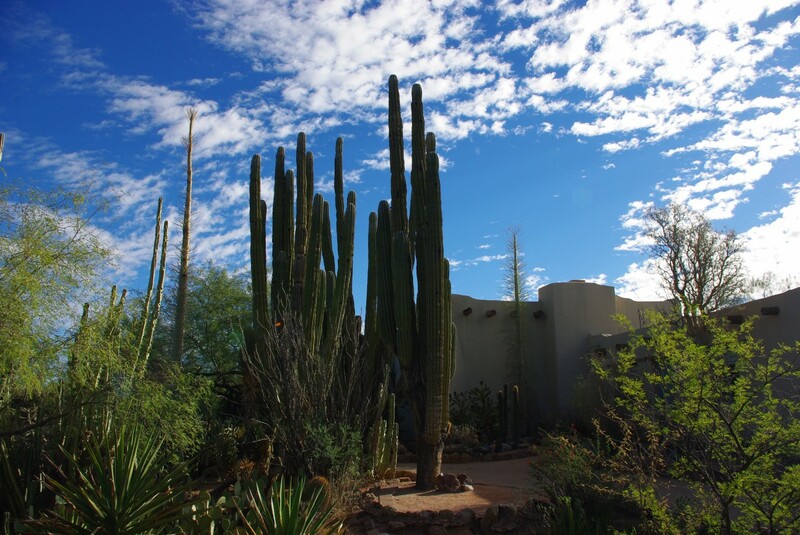 The Plants & People of the Sonoran Desert Trail contains a wide range of items. A desert oasis contains a pond fill with reeds and wildlife. 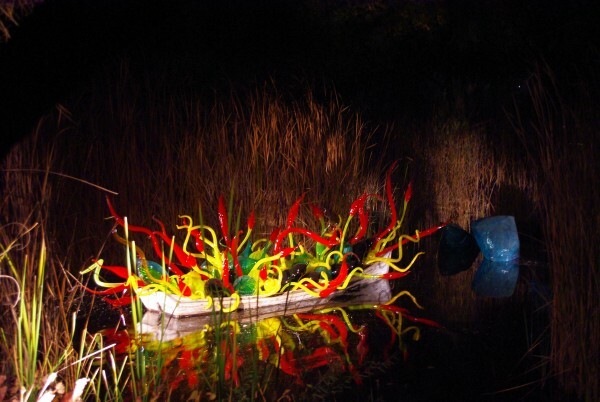 Chihuly’s “Sonoran Boat” also floats on the surface of the pond. Further on a large stand of cottonwood trees appears and a replica of a native crop garden. Other Native American structures occupy areas along the trail. A tiny Anna’s hummingbird perched on a wire attached to one of the structures, and more Chihuly sculptures popped up along the trail. 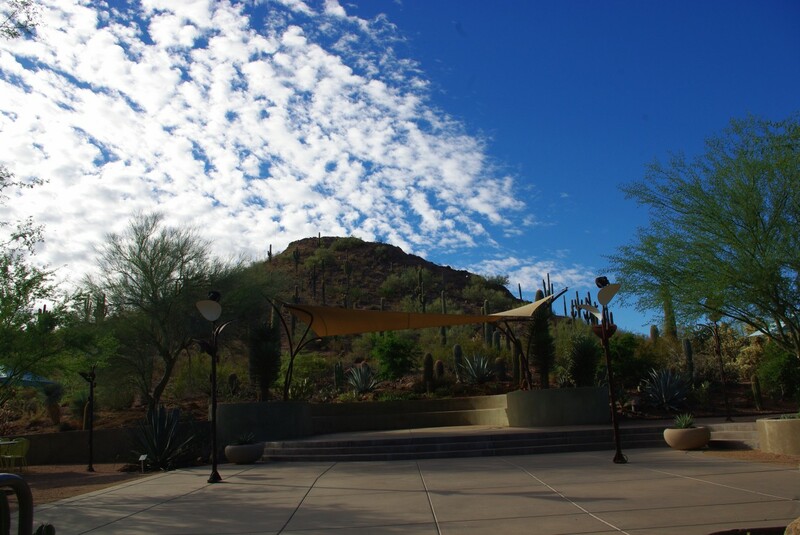 Visitors get a great view of Camelback Mountain from the top of the Sonoran Desert Loop Trail. I made some stops along the Desert Discovery Loop Trail before I entered the butterfly pavilion. The pavilion’s an intimate place to study and enjoy the monarch butterflies as they float through the pavilion or land on some of the colorful plants and trees contained in the pavilion. 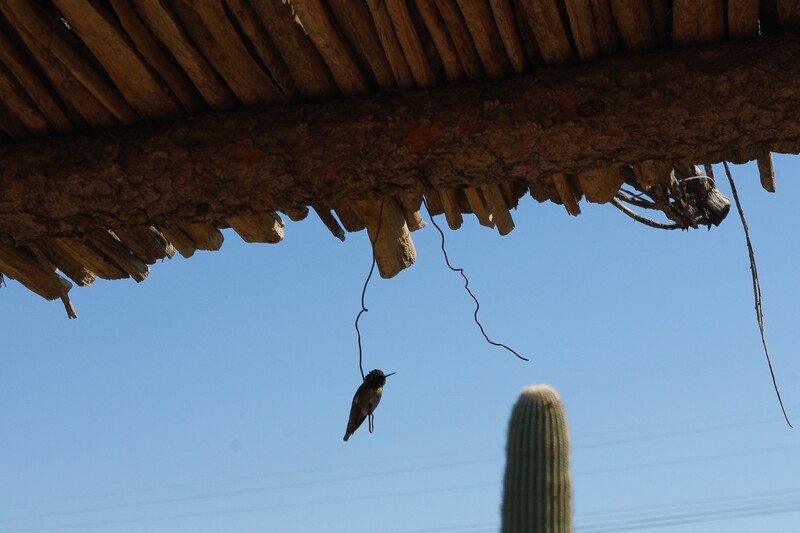 A tiny hummingbird perches on a building located along the Plants & People of the Sonoran Desert Loop Trail. Volunteers gave information to visitors and handed out magnifying glasses to little children so they could watch the monarchs as they perched on plants and drank nectar. As the temperature got warmer, the monarchs became more active. 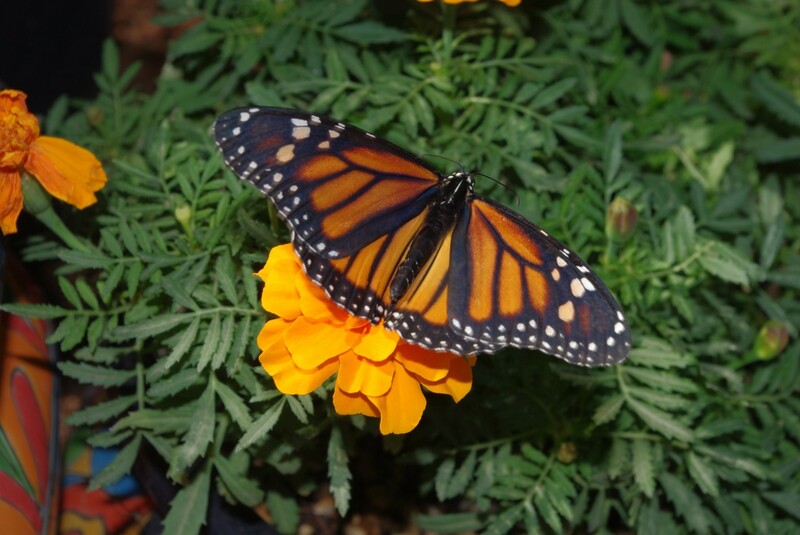 A monarch butterfly rests on a bright yellow flower in the butterfly pavilion. 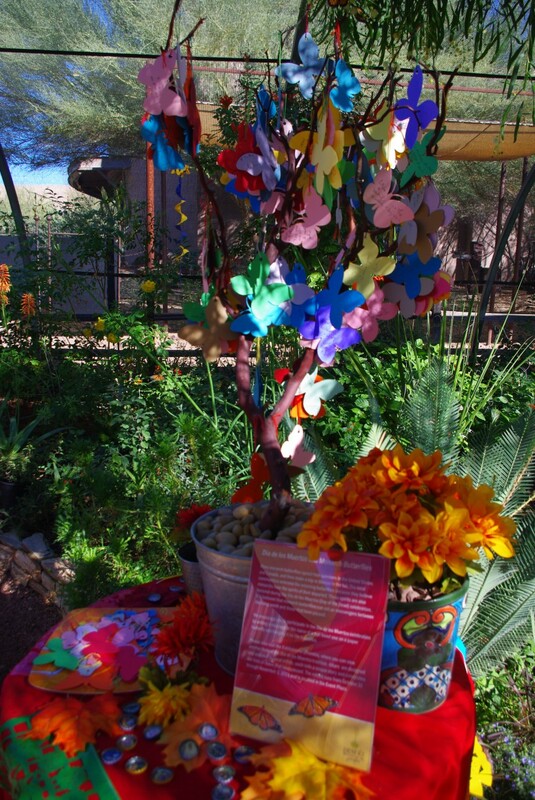 A colorful butterfly tree allowed visitors to write notes to dead loved ones as the garden celebrated the Day of the Dead. At the Stardust Foundation Plaza, workers constructed another Chihuly sculpture. In the adjacent Succulent Gallery, a large Chihuly sculpture suspended from the top of the structure nestled between the succulent plants. One of the succulents sported a large, burgundy colored bloom. 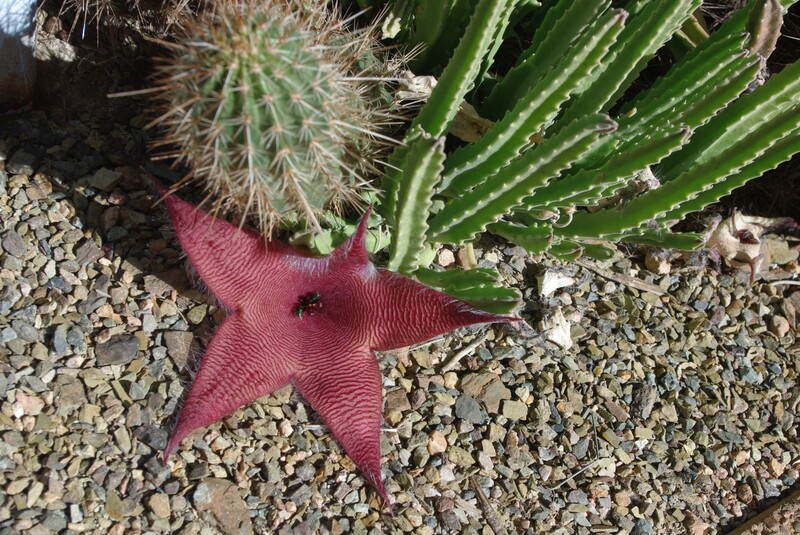 A unique star flower bloomed in the Succulent Gallery. As I left the garden at 11 a.m., I passed through the Garden Shop to admire the selection of glass creations, butterfly ornaments, books, plants and other items. 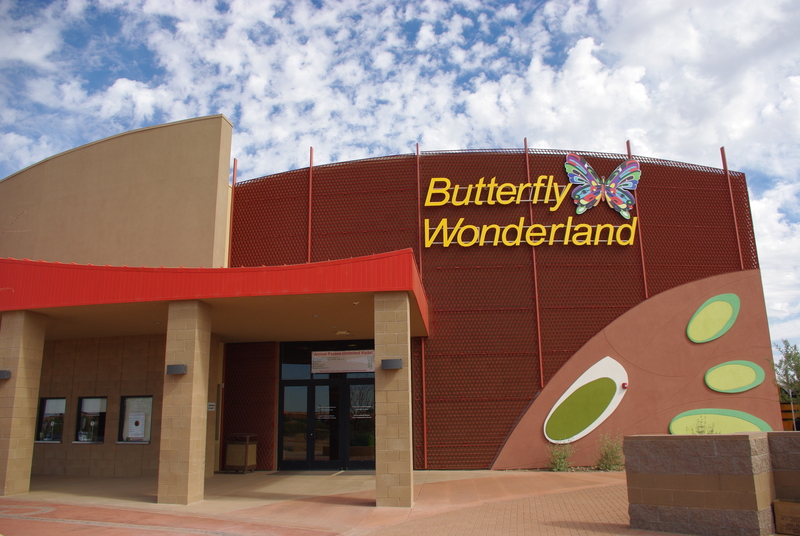 The entrance to Butterfly Wonderland hints at the magic inside. With a diagnosis of tuberculosis and only six months to live, Boyce Luther Gulley disappeared, leaving his wife and three-year-old daughter, Mary Lou, and his home in Seattle, Washington to live by himself in Phoenix, Arizona. His six month prognosis extended to 15 years, and as he lived in Phoenix, Gulley built a Mystery Castle on rugged, rocky land located in the Foothills of South Mountain Park and fulfilled a promise to his daughter to build her a sturdy castle in the desert instead of a sand castle that washed away on the beach. 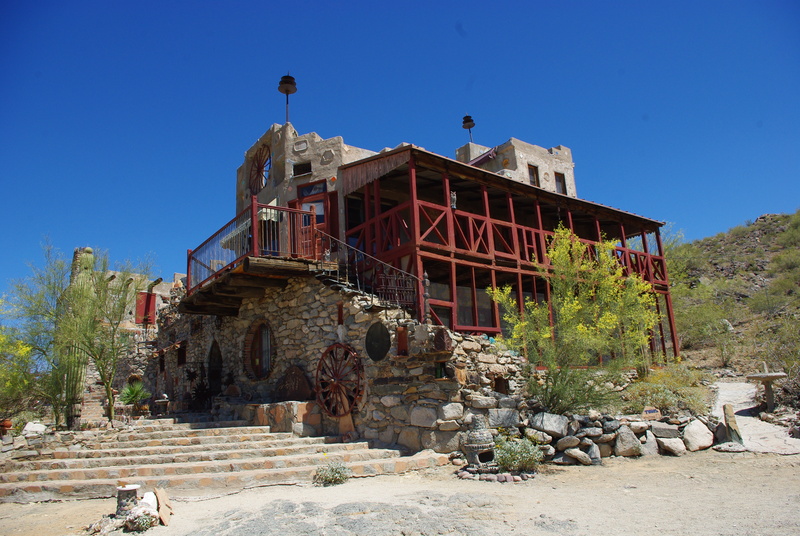 Boyce Luther Gulley built this sturdy, unique castle over the 15 years he lived in Phoenix. 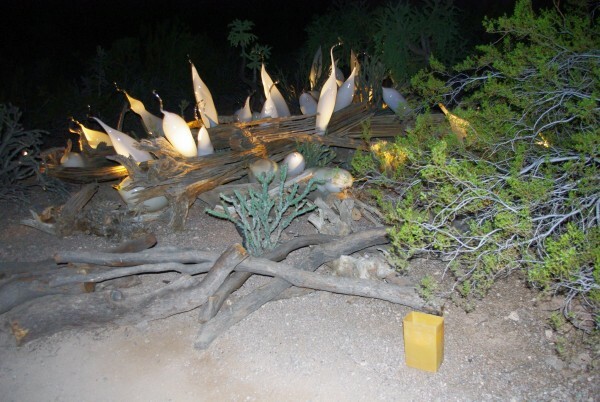 On May 30, 2013 at 7 p.m., visitors gathered at the Ottosen Entry Garden for the first welcome and orientation for the Desert Botanical Garden’s 2013 Flashlight Tours. Volunteers distributed flashlights and handed out Flashlight Tours trail maps before visitors descended on the garden in groups. Visitors meet at the Ottosen Entry Garden for the Flashlight Tours orientation. Easter Sunday dawned bright and beautiful. The warmth of spring hung in the air and a cloudless blue sky touched the mountains and desert. Every flower and plant seemed to be in bloom, and I decided to spend the day celebrating Easter at the Desert Botanical Garden. The Chihuly “Desert Towers” sparkle in the morning sun. The Garden’s always beautiful whether during the holidays or on a regular day. Before I crossed the iron bridge, I spied a pink hedgehog flower. 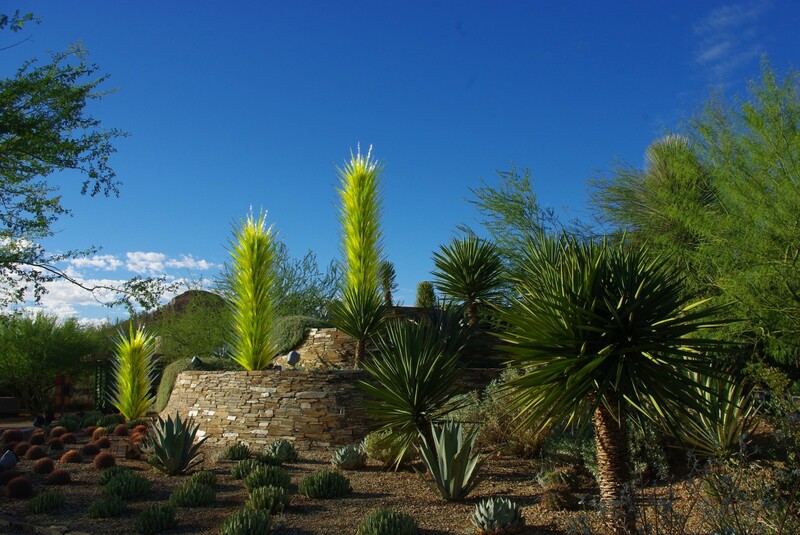 The Chihuly “Desert Towers” sparkled in the early morning sunshine while yucca plants and other plants revealed their beautiful flowers. Vibrant orange claret cup cactus bloom along the Ottosen Entry Garden path. 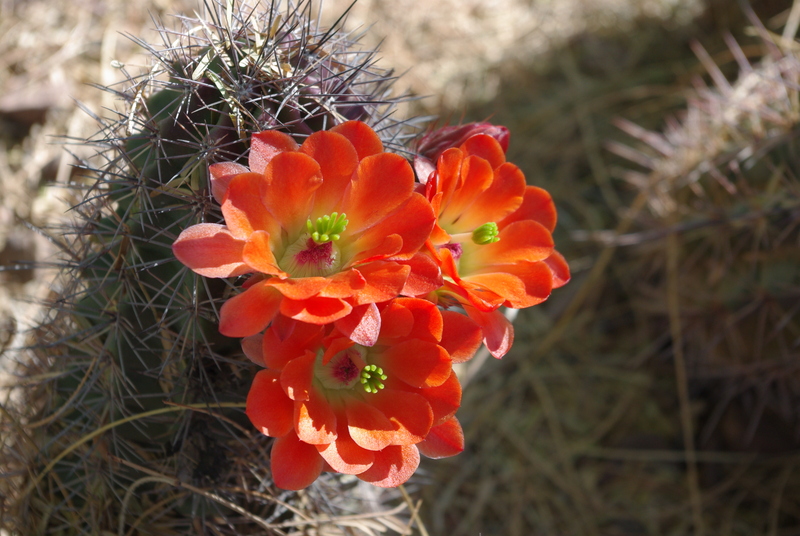 Bright coral claret cup cactus flowers bloomed along the pathways in the Ottosen Entry Garden. Delicate blue flowers bloomed among the fishhook cactus as visitors posed for photos and birds sang. Barnes Butte acts as a backdrop for a variety of blooming desert plants. Along the Harriet K. Maxwell Desert Wildflower Loop Trail, an array of different, vibrant colors brightened the trail. Vivid yellows from the creosote and brittlebush blended with the delicate white and pink of Mexican poppies, the vibrant pink of prickly pear and the lavender, purple and reds of various desert flowers. 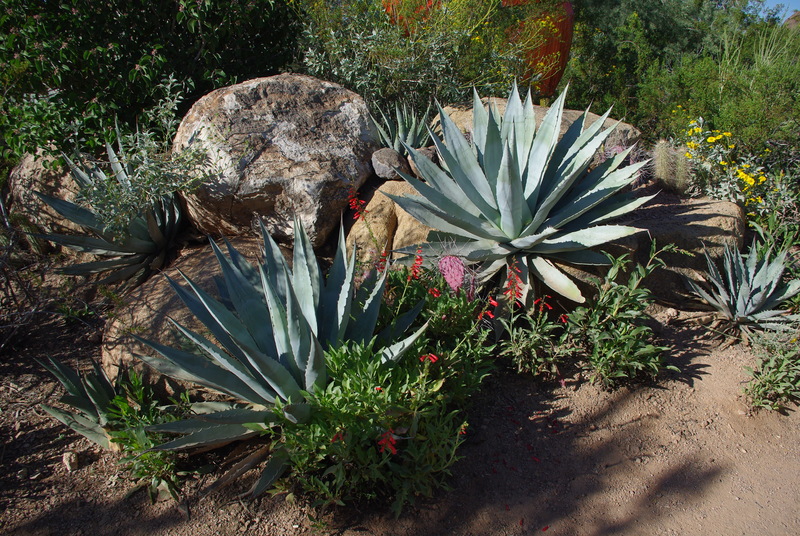 The agaves and wildflowers nestle among the boulders. 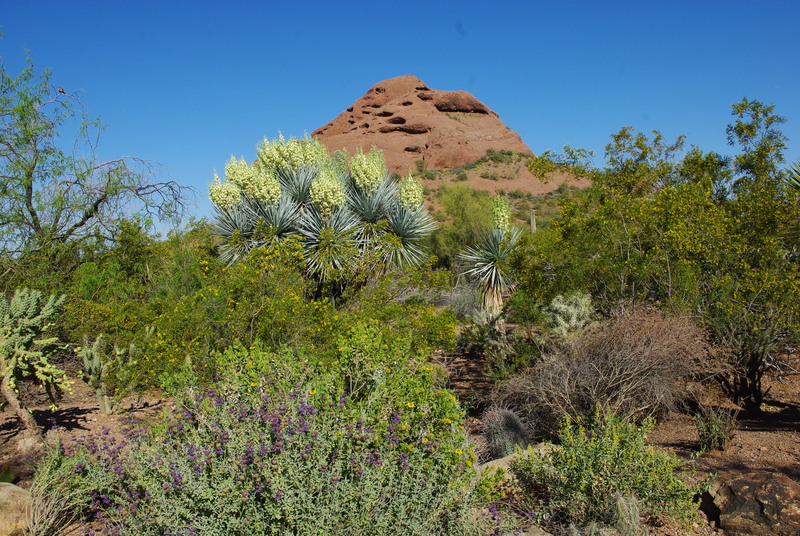 Barnes Butte stood as a backdrop for blooming yuccas and desert flowers while agave and desert flowers grew among the boulders along the trail. 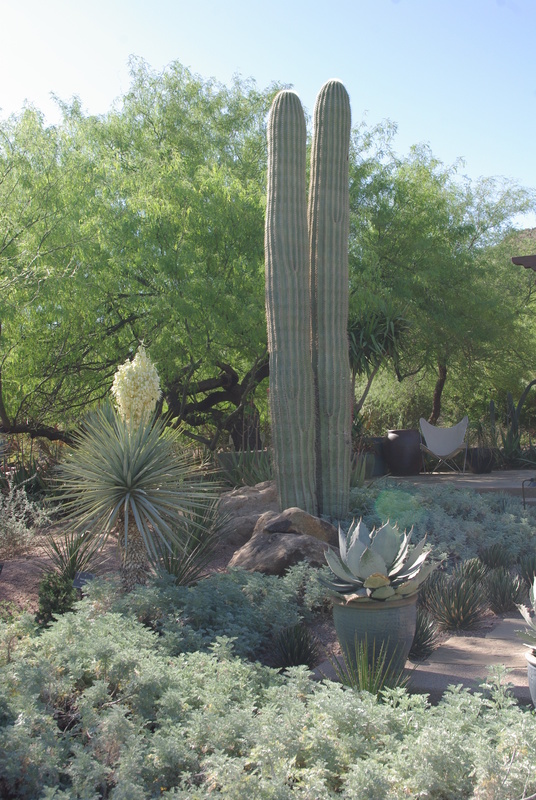 Butterflies and hummingbirds flitted by as cactus wrens scolded and mockingbirds sang. The “St. Earth Walking” statue watches over the Steele Herb Garden. At the Steele Herb Garden, the St. Earth Walking statue stood in all her glory as she looked over the herb gardens and the sundial, which read 9 a.m. Nestled in a crevice on her shoulder, a pair of mourning doves decided to set up housekeeping. Vibrant Flowers bloom throughout the Steele Herb Garden. 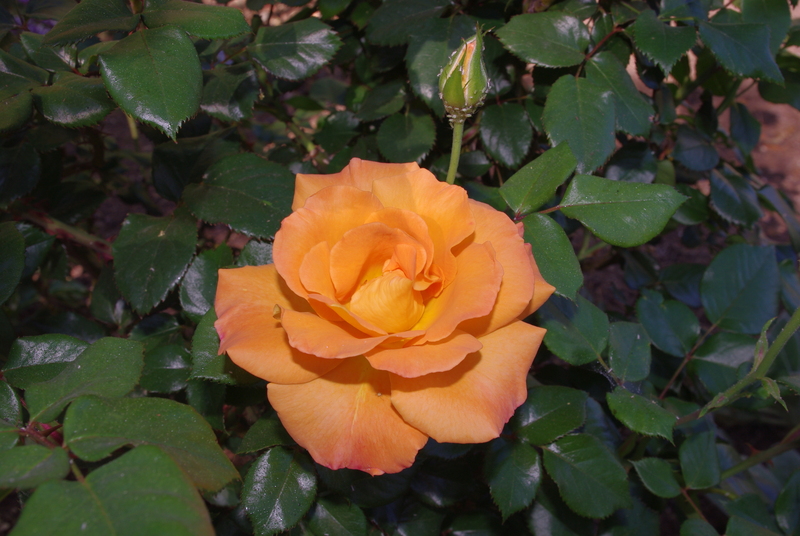 Roses, poppies and other vibrantly colored flowers bloomed along the pathway, among the cactus and climbed the trellises and walls. Peace and serenity enveloped the area. 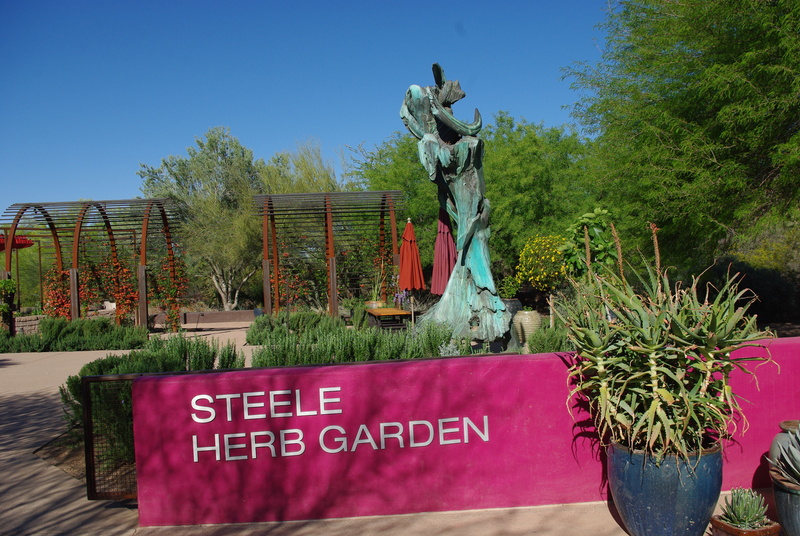 Desert plants line the entrance to the Steele Herb Garden. A little past 9 in the morning, Ullman Terrace remained deserted except for a few errant birds perching in trees and Gambel’s quail skittering along the edges of the terrace. 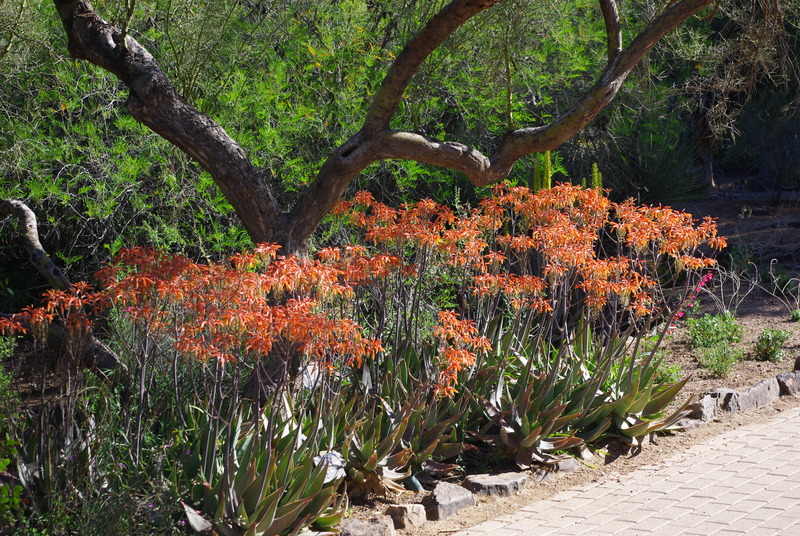 Back on the main Desert Discovery Loop Trail, a mass of bright orange aloe vera flowers caught my eye. Orange aloe vera flowers bloomed in profusion along the Desert Discovery Loop Trail. I left the main trail to climb the Sonoran Desert Nature Loop Trail and take in the surrounding vistas. Visitors relax and take in the views from the Pratt Ramada at the top of the Sonoran Desert Nature Loop Trail. In early morning, one may glimpse the coyotes walking along the mountain path at the top of the trail. Many species of cactus dotted the trail and the mountain vistas stretched in front of me as I made the descent back to the main trail. Visitors encounter spectacular mountain views from the top of the Sonoran Desert Nature Loop Trail. 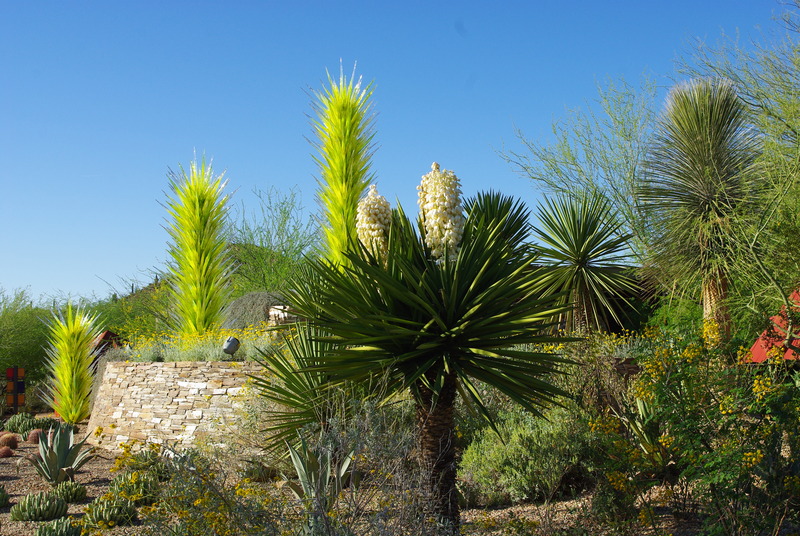 As I made my way to the Maxine and Jonathan Marshall Butterfly Pavilion, a stretch of the main trail adjacent to the Berlin Agave Yucca Forest held a sampler of desert plants in bloom. There sizes, shapes and colors represented the various plants found on the desert. 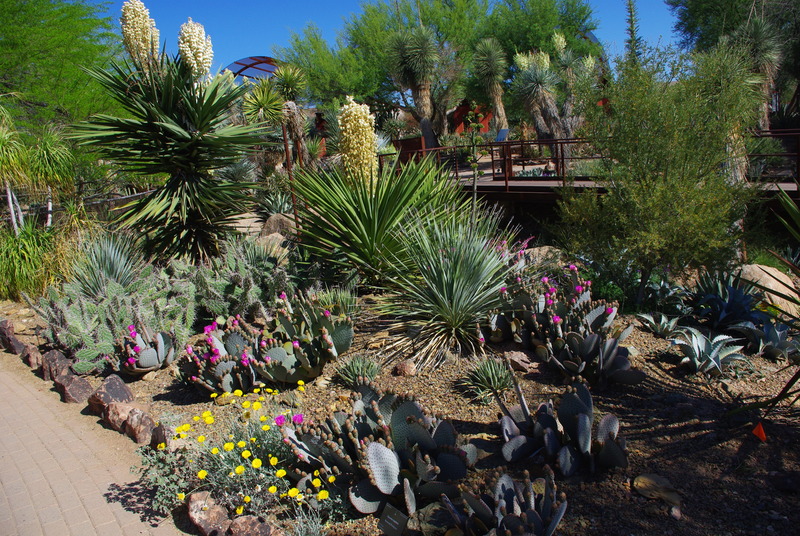 A variety of desert plants bloomed along the Desert Discovery Loop Trail adjacent to the Berlin Agave Yucca Forest. Inside the butterfly pavilion, butterflies flew from one flower to the other sucking up the nectar for their breakfast. Some landed on startled but enchanted visitors while others landed on the hard ground and found themself in peril of being stepped on. 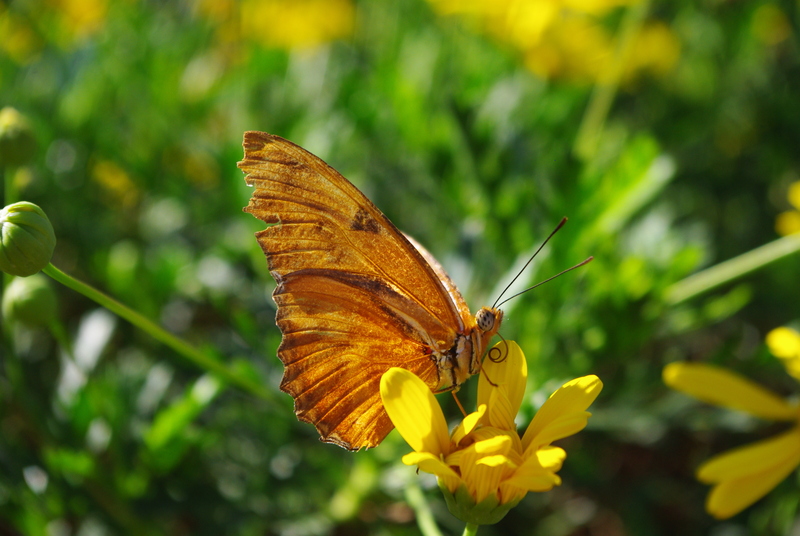 A butterfly perches on a flower. Even though visitors filled the pavilion, it seemed to radiate peace, beauty and quiet for those assembled. Some butterflies posed while others fluttered and never landed long enough for a good photo. The flowers as well as the butterflies added to the beauty and tranquility of the pavilion. 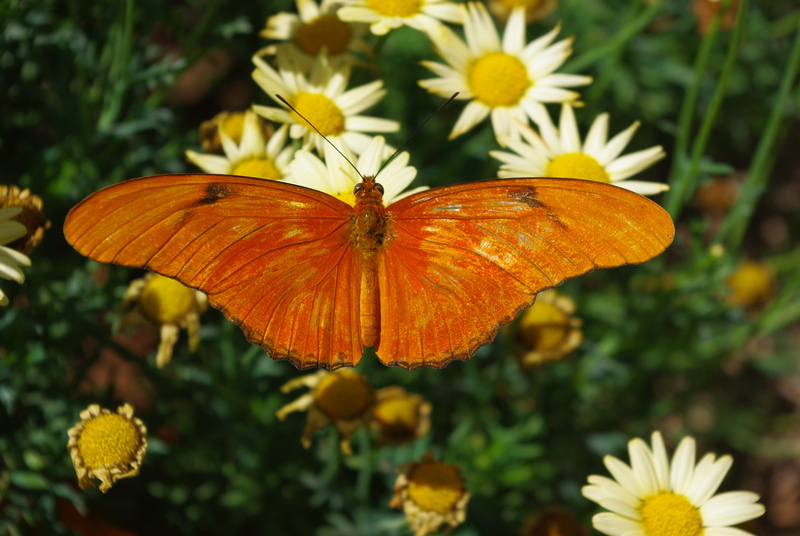 A julia butterfly mingles with the flowers at the butterfly pavilion. As I left the butterfly pavilion and retraced my steps along the main trail, I decided to head off to a secluded portion of the garden. Overhead I heard the incessant chirping of a bird. Not until I looked up into the tree did I realize that it was a bright, red cardinal. He continued to chatter even after he became the center of my attention, and I took some photos of him as I smiled because I always smile when a red cardinal comes into view. It lets me that my dad watches over me. 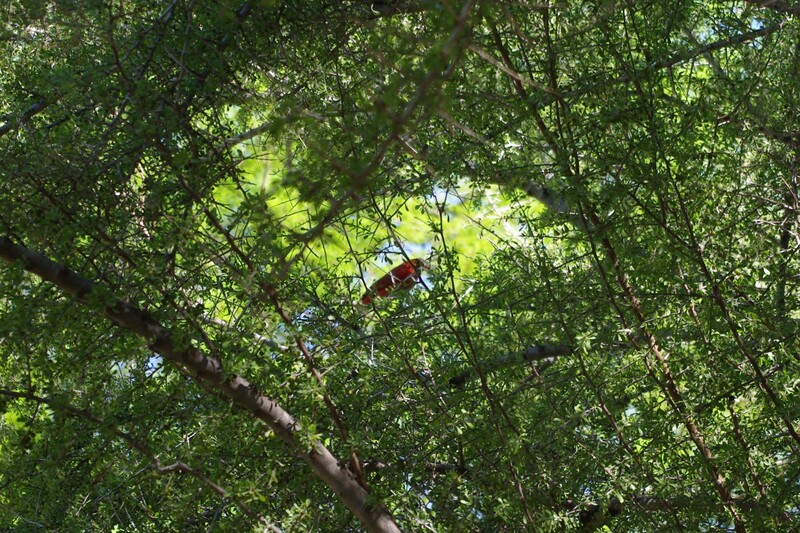 A bright, red cardinal chirps in a tree off the main trail. 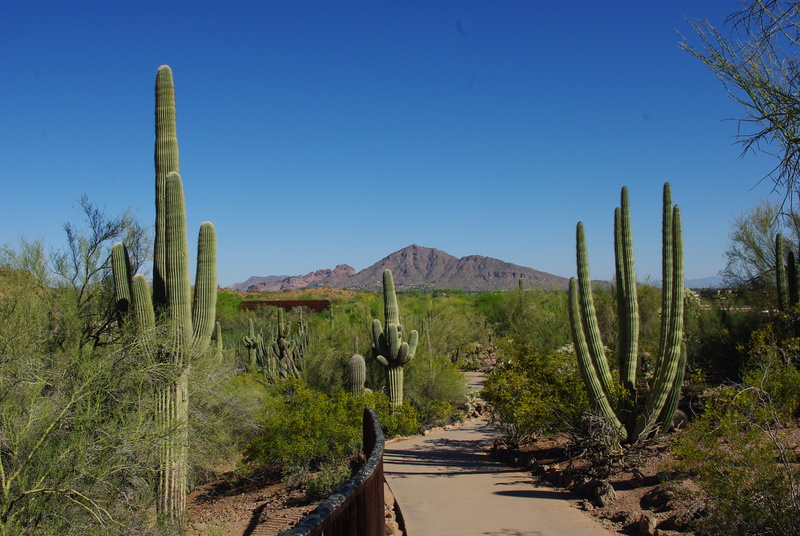 I headed to the Plants & People of the Sonoran Desert Loop Trail. 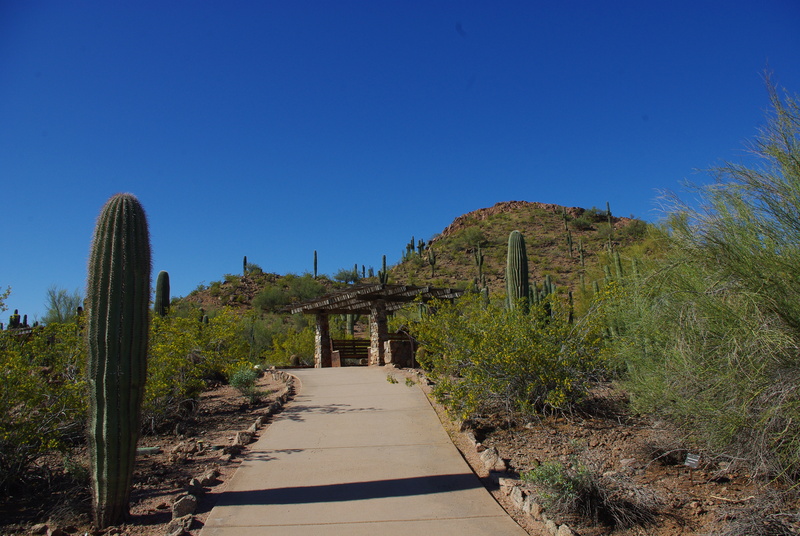 Not only does this trail have examples of how the American Indians lived in the region long ago, but it also contains scenic views and a rare crested saguaro. Lizards and Gambel’s quail skittered along the path and a rock squirrel dove into his burrow under a large rock at the edge of the trail and in front of a secluded stone bench. 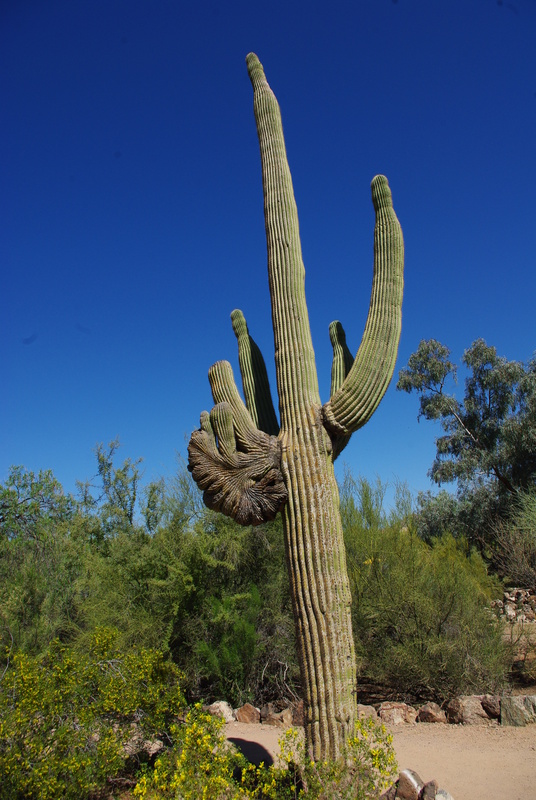 A rare crested saguaro resides along the Plants & People of the Sonoran Desert Loop Trail. 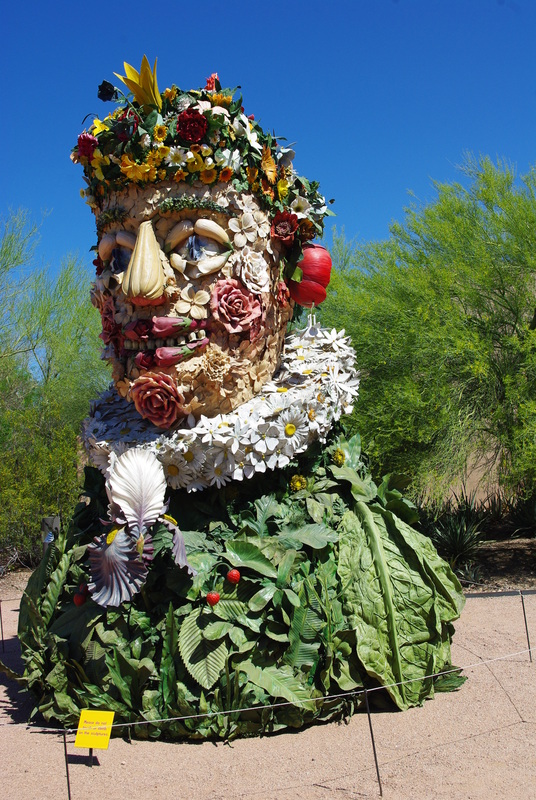 Back on the main trail, I headed to the Stardust Foundation Plaza located between the Sybil B. Harrington Cactus and Succulent Galleries to photograph “The Four Seasons” by Philip Haas. These huge sculptures depict the four seasons by using fruits, vegetables, flowers and various other objects related to each season. Spring is one of “The Four Seasons” by Philip Haas located at the Stardust Foundation Plaza. With the temperature growing warmer and my tummy growing hungrier, I decided to take some of the less travelled side trails and head for the exit. Many others just arrived as I finished up my glorious Easter morning. 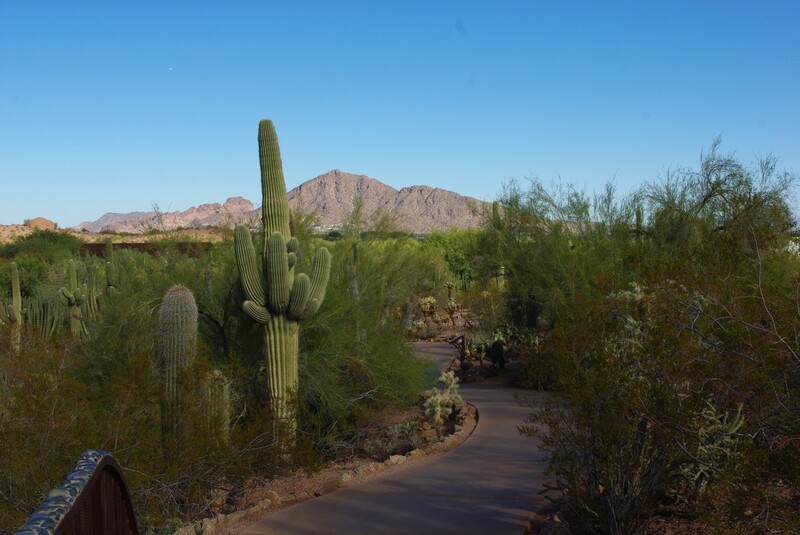 The Desert Botanical Garden holds special meaning at all times of the year, but on this day, it seemed even more special. 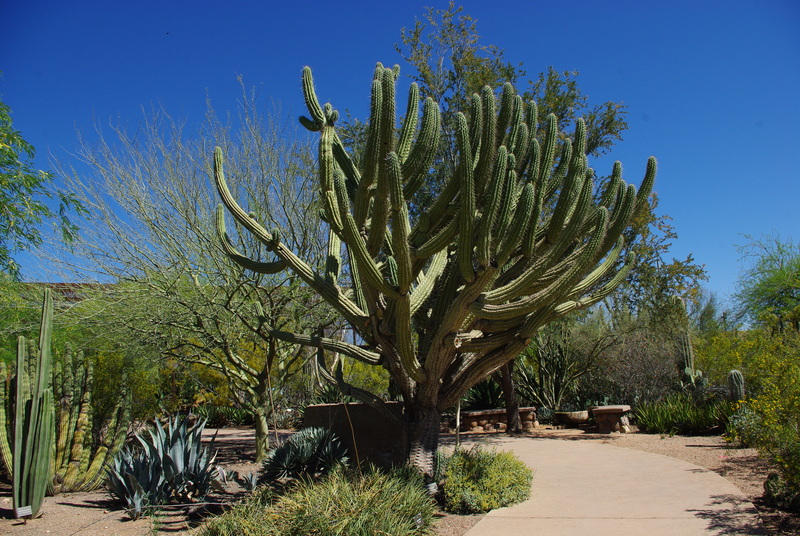 A huge, beautiful cactus inhabits a space along one of the out-of-the-way trails. The sunset over Phoenix lit up the buttes. The sunrise lit up the sky on Christmas morning! As fall and cooler temperatures arrive in Arizona, folks enjoy a spot of afternoon tea at an authentic English tea room. 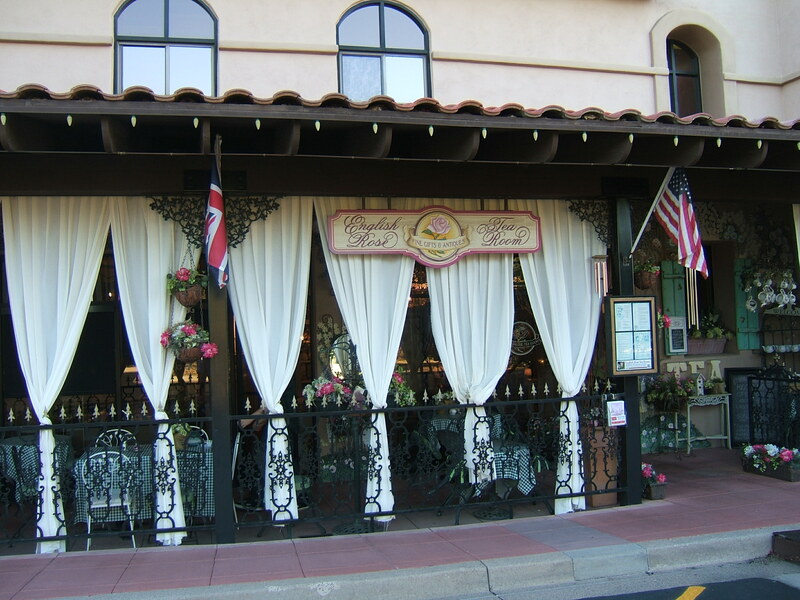 The English Rose Tea Room, located at 201 Easy Street in Carefree, Arizona, offers patrons an opportunity to enjoy tea inside or outside. Lacy table cloths, frilly curtains and decorations, beautiful paintings and photos and comfortable chairs decorate the area. Delicate English bone china tea pots, tea cups and plates with various hand-painted floral designs add to the beauty of the tea tradition. The English Rose Tea Room serves traditional English afternoon tea. The Musical Instrument Museum combines everything musical from all over the world to share with visitors. The huge, beautiful building houses every musical instrument imaginable and gives visitors the opportunity to explore exhibits on a self-guided tour with wireless audio headphones and flat-panel monitors to demonstrate the music created by the instruments in their natural environments. 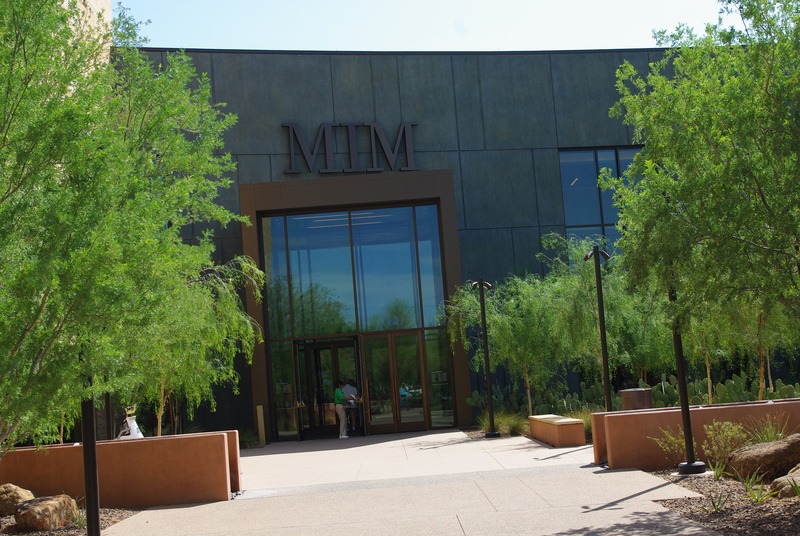 Volunteers greet visitors at the entrance to MIM.